Polling conducted after the state legislature ended its prolonged summer budget standoff, and released exclusively to TMS, sheds new light on public perceptions of the state budget debate and calls into question polling released earlier this summer. On August 15th, the Rasmuson Foundation issued a statement saying their Alaska Attitudes on the State Fiscal Climate survey indicated “tapping the excess earnings of the Permanent Fund and capping the amount of the annual dividend were the most popular revenue options” and “by a 2 to 1 margin, (Alaskans) would rather pay sales or income tax than experience deep cuts to essential public services.” The new numbers call both of these claims into doubt. The polling was conducted by Harstad Strategic Research, Inc from July 19th-26th and sampled 602 Alaskans who voted in the 2014 midterm elections. The results show one key message does seem to be getting through to voters:news out of the Capitol isn’t good. 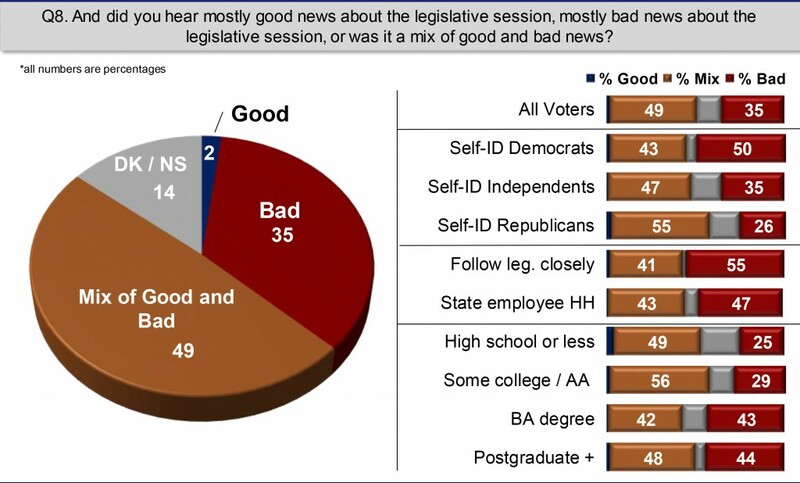 When asked if they had heard good news, bad news or some mix of each about the legislative session only 3% of respondents said they heard mostly good things compared to 35% who heard mostly bad news. 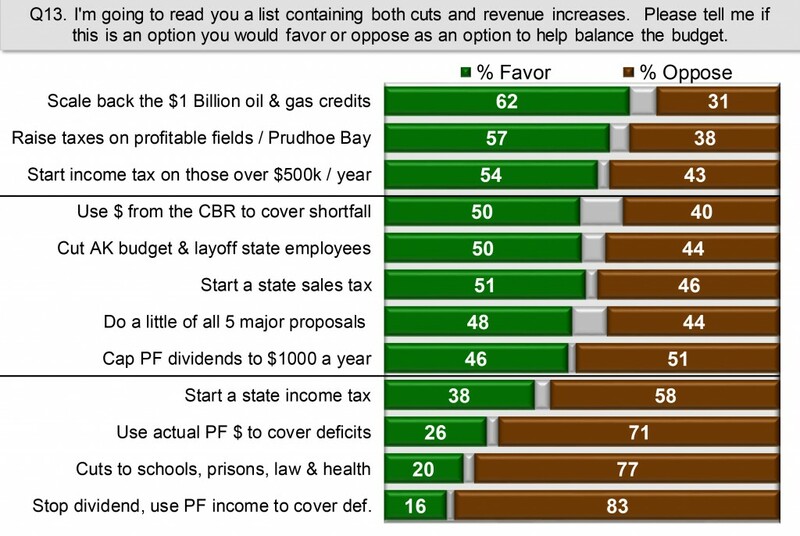 When it comes to the question of using the Permanent Fund to fund state government by either capping the dividend or using some portion of the fund’s revenues, the Rasmuson Foundation claimed these “were the most popular revenue options” with capping receiving 55% support and using fund revenues receiving 66% support. The Harstad poll, however, found that neither of those options elicited even majority support. Capping the Permanent Fund Dividend got 46% support and use of the Permanent Fund itself garnered only 26% support. As with any polling, a lot has to do with how the questions are asked, but the Harstad data at the very least shows use of the Permanent Fund is far from a “popular” choice. The claim that Alaskans would welcome sales or income taxes “by a 2 to 1 margin” over seeing significant cuts to government services also appears to have reason for doubt. The Harstad poll showed an income tax only garnered a majority of voter support if it was limited to those making over $500,000 a year. When a broad-based income tax is mentioned support drops to only 38%. As for a sales tax, it receives 51% support, but also garners 46% in opposition, hardly overwhelming support. On the spending cuts side of the equation, 51% of respondents said they support cutting the budget and laying off state employees. That number drops to 20%, however, only after specific areas to be cut are mentioned. When the question of new taxes or cuts are broad and nonspecific, the spending cut polling is almost identical to a sales tax and twelve points higher than an income tax. There are many conclusions reasonable people can draw from this data, but that new broad-based taxes on the public are overwhelming more popular than spending cuts shouldn’t be one of them. Interestingly, the revenue options that did test best were scaling back oil and gas tax credits (62%), raising taxes on producers (57%), and instituting an income tax on the wealthy (54%). It seems Alaska voters are perfectly fine with new taxes so long as they are not likely to be the ones paying them. 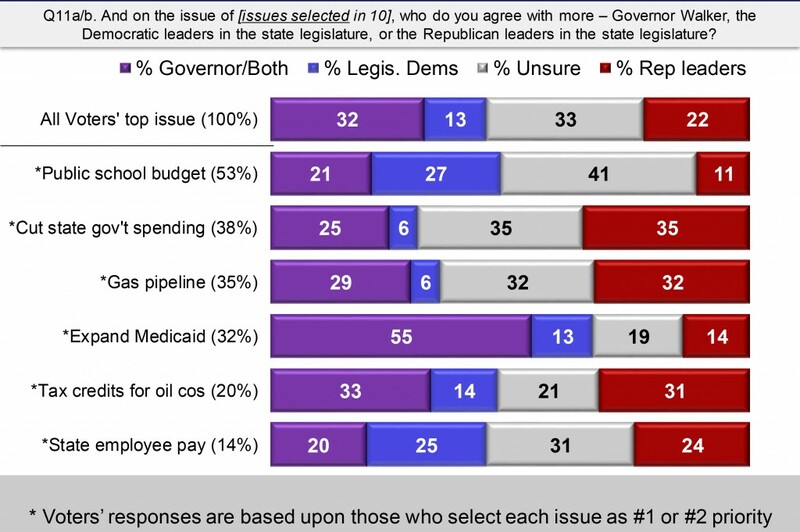 The Harstad numbers also show the Governor and his Democrat allies in the legislature do well when voters are asked who they agree with on state issues. The Governor and Democrats hold their own with legislative Republicans on cutting spending and oil and gas issues, while scoring far better when it comes to issues like Medicaid expansion and public education funding. The Governor’s people have to feel good about that given the contentious and protracted battles he just fought with legislative Republicans. 2 Comments on "******TMS EXCLUSIVE****** New Polling Sheds Light On State Budget Debate"
Odd that the poll did not seem to list using the Permanent Fund earnings reserve, which is the first lever most at the Fairbanks conference chose, as one of the options. @@bgkeithley:disqus They asked the Perm Fund question three different ways. That gives you, I think, a fair look at where people’s opinions are. That is the point of a poll. If you asked the ER question specifically, you would have to explain so much it starts becoming a push poll (one way or the other) and not a survey of public opinion.